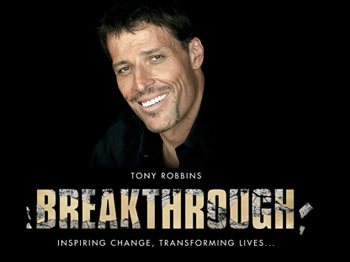 Last week, a new show aired on NBC called “Breakthrough With Tony Robbins.” Now I’ve made no qualms about the fact that I’m kind of a fan of Tony’s even though there are some things that he does that I don’t agree with. Either way, the man knows how to get people off their butts and improving their lives, and hey, who wouldn’t like that, right? If you haven’t seen the show, click the picture above to go to NBC.com’s website and you can watch it there. The first episode showcased a couple, Frank and Karen Alioto, that got married two years ago and suffered from a terrible accident on the day they got married. Frank became bound to a wheelchair, and as a result, it completely changed the dynamics of their relationship from lovers to caretaker and caretakee. Tony flies them out to his home in Fiji and gets them started right away. He tells them that their first task is to go skydiving together. This is where the theraputic theory comes into play. Albert Bandura is the father of Social-Cognitive Theory. Within his theory is a system called “the Self System” which is instrumental in our concepts about ourselves. Additionally, he also came up with the concept of Self-Efficacy, which is “the belief in one’s capabilities to organize and execute the courses of action required to manage prospective situations” (Self-Efficacy in Changing Societies, Bandura, 1995, p. 2). After watching “Breakthrough”, much of what Tony was doing with this couple was challenging their Self-Efficacy. He was asking them to put aside their beliefs about their own capabilities and execute courses of action that would help them save their marriage. Tony’s methods seem a bit unorthodox, but they seemed to work for this couple. Bear in mind too, that there are some people out there unwilling to change their concepts of self, and an effective coach or therapist must be skilled enough to be able to size up their client, and be able to offer solutions that will work best for them. If I told some of my clients that they needed to go skydiving to manage their fear of heights, I doubt it would go over well. Bandura also mentions that developing strong efficacy is through “mastery experiences.” These experiences are a double edged sword. If completed, they can improve one’s self-efficacy. If failed, they can weaken it. So Tony needed to make sure he was making the right call with this couple, and that the tasks he sent them on were going to work. Otherwise, he could have done more harm than good. Tony also used Bandura’s concept of social modeling, which basically states that if you witness someone doing something successfully, then it increases your belief in your ability to do it. This was shown through Frank being taught how to play Murderball, and rooming with a guy who was also bound to a wheelchair, but had a successful and loving relationship with his wife. So what’s my point? My point is that Tony uses in practice some very powerful psychological techniques taken straight from the playbook of Albert Bandura. I’m sure there are some methods I missed, and some parts of his technique that draw from other areas of expertise. However, my goal in pointing this show out to you is to get you motivated to check it out, and question your own irrational beliefs, and to consider that the techniques used in the show are actually part of solid psychological theory. Bear in mind too, that this is TV. So big budget skydiving trips and automobile repair are part in parcel with the funding necessary to put on a good show (never mind the plane tickets to Fiji). So like anything else, I would encourage you to recognize this show as an effective visual tool to draw experience from. Remember Bandura’s Social Modeling sourch of Self-Efficacy. If you can see someone else overcome their difficulties, what would it take for you to overcome yours? Oh, and the next episode is on Tuesday night, 8pm/7pm Central.